(CNN) -- Americans set a record for number of votes cast in this presidential election but failed to make history with the percentage of voter turnout, experts said. 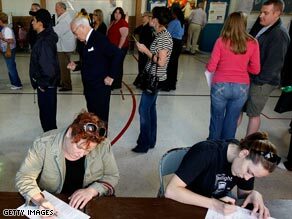 A record 2.9 million voters cast ballots Tuesday in Missouri. Curtis Gans, director of American University's Center for the Study of the American Electorate, said Thursday that percentage turnout was lower because Republicans stayed away from the polls. Disappointment over Sen. John McCain's choice of Alaska Gov. Sarah Palin as his running mate, combined with a perception that the ticket would lose, prompted many would-be Republican voters to ditch the polls on Election Day, Gans said. "There was real hostility ... amongst moderate Republicans" that McCain would choose the conservative governor, Gans said. "And then there was a gradual perception that the party was going to get whomped." Nevertheless, between 126.5 million and 128.5 million Americans cast ballots this year, according to a report by the electorate study center. Successful Democratic get-out-the-vote initiatives contributed to that number, which shattered 2004's mark of 122.2 million. The report surveyed 47 states and the nation's capital. Twenty-two of those states and the District of Columbia reported an increase in voter turnout this year, the center said. GOP turnout increased in only eight of the surveyed states, according to the report. The percentage of registered voters casting ballots this year is projected at 60.7 to 61.7 percent, according to the center -- a figure much lower than the modern-day record set in 1960 -- 67 percent. Democrat Barack Obama's campaign is credited with building a sophisticated organization at local levels in key states that energized voters to register and to stand for hours in line to cast early ballots. Nationwide, early votes totaled at least 31.7 million in at least 30 early voting states, said Michael McDonald, a professor at George Mason University. McDonald, who also produced projections of voter turnout, estimated Friday that 130.9 million ballots were cast by 61.5 percent of Americans who were eligible to vote. The final tally is expected to be counted by early December, he said. Gans said many people believed this election's turnout would shatter the 2004 mark because of the high amount of early voters, including African-Americans and younger voters, who historically vote in lower numbers. "We failed to realize that the registration increase was driven by Democratic and independent registration and that the long lines at the polls were mostly populated by Democrats," he said. Absentee ballots tend to flow in at the last minute, McDonald said. But this year, with so many people participating in early and absentee voting ahead of the election, there may not be a large flood of absentee ballots, he said. He said Friday that turnout rates rose in states that became battlegrounds in this election. On the other hand, he said, voter turnout in states that lost battleground status was lower or held steady, compared with 2004. Battleground state North Carolina's turnout rate had the largest increase from 2004, according to the center. The state reported a 69 percent turnout rate -- up from 56.8 percent in 2004, according to center data. Missouri, another battleground, reported a record number of voters on Tuesday: 2.9 million. But its turnout percentage -- 69.4 percent -- failed to make history. In Maine, the secretary of state's office projected a record-setting 80 percent turnout among registered voters, which would break Maine's previous record of 74 percent in 2004. Georgia, which saw a 61.3 percent turnout, up from 54.7 percent in 2004, also had a record high turnout, according to data from the center. In 1908 -- when the voter pool was much smaller because African-Americans and women were denied the vote -- 65.7 percent cast ballots in the race between William Howard Taft and William Jennings Bryan. Towering above this year's turnout was the historic race of 1860, when Abraham Lincoln and Stephen A. Douglas faced off, attracting 81.3 percent.